It’s a mad dash to the holiday finish line. The other day I looked in the fridge and noticed that it was basically empty. When did that happen? I had butter and eggs (and everything else that I needed in the cabinets to make cookies), but I had nothing to make “real food.” You know, something to eat for dinner (aside from cookies of course). Please tell me someone else can relate. I went to grocery store yesterday and got something other than cookie ingredients, but I’m still left with the thought of “I don’t want to cook or I don’t have time to cook.” That’s where this quinoa recipe comes in. 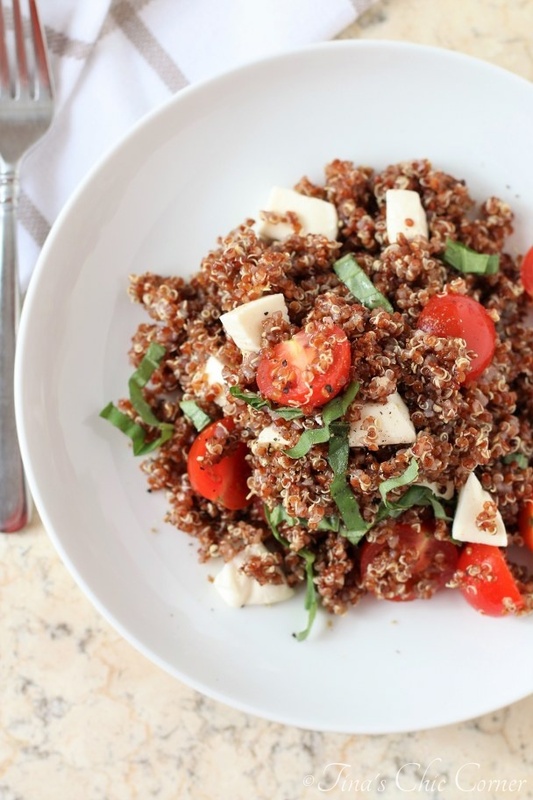 Picture quinoa and a caprese salad combined together and that’s what you’ve got here. You can whip this up pretty quickly and the leftovers make for even a quicker dish. 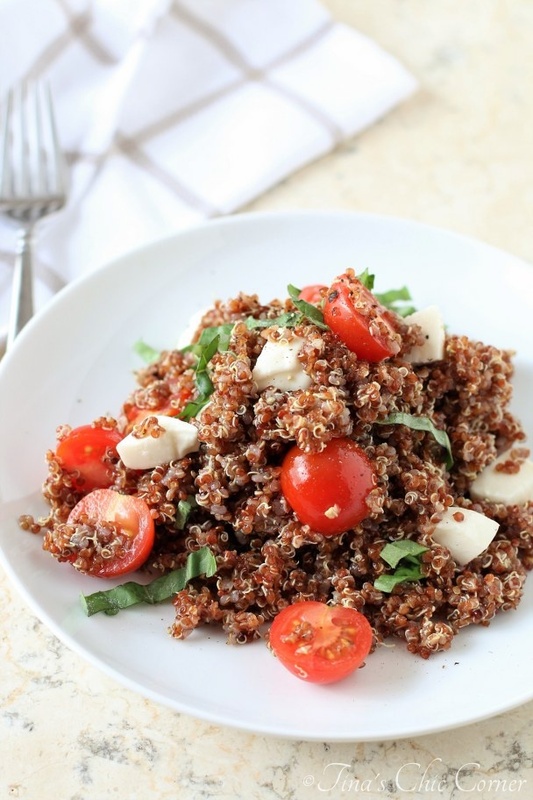 It tastes better the next day because the quinoa has time to soak up the flavors from the dressing and basil. I think that this meal is meant to be used as a side dish but since quinoa is so healthy I don’t feel guilty having it as the main course for lunch or dinner. To make the dressing, whisk together the oil, balsamic vinegar, salt, and pepper. (I like to make this in a measuring cup so that it’s easier to pour onto the salad.) Set this aside. Once the quinoa has cooled, move it to a large bowl. Add in the sliced grape tomatoes and cubes of mozzarella cheese and stir everything together. Sprinkle in the sliced basil and pour in the dressing and then stir again. Taste it to see if you would like to add more salt or pepper. You can enjoy it now or chill it in fridge to enjoy later! You know Tina, this really looks good and I don’t like tomatoes. LOL. I agree, sometimes you just don’t feel like eating pork, beef or chicken and quinoa is prefect protein substitute. Thanks!